The tank is the most expensive component of a rainwater harvesting system. This is true whether the tank is above ground or below ground. Consequently, many people opt to undersize the tank in order to save money. Fortunately, there are alternatives to solid-walled tanks that can reduce the cost of a system. Conveyance, in a rainwater harvesting system (RWH), carries the rain from the roof (i.e. the capture system) to the storage tank (i.e. the holding system). Sounds simple, but it can range from being almost nonexistent to extremely sophisticated and attractive. This article will deal with the simpler solutions. Storage tanks, usually the most expensive component of the rainwater harvesting system, come in a wide variety of sizes and types. When deciding on the type of tank to use, the main factors to consider include where you live and your budget. When choosing the size of storage tank or cistern, consider several variables: rainwater supply (local precipitation), demand, projected length of dry spells without rain, catchment surface area, aesthetics, personal preference, and of course, your budget. Understanding how water gets from the catchment tank to the faucet can help people on rainwater catchment systems feel more comfortable with their system and be more self-reliant. A normal pump system is composed of a pump, a pressure tank, a pressure switch, and a check valve. These main components all work together automatically to supply pressurized water to your point of use. You have decided to invest in a rainwater harvesting system, but where do you start? What questions do you need to answer before you can build the right system to harvest rainwater? Let’s start with learning how much rain you can collect. A cross connection is a physical link, such as a jumper connection or swivel arrangement, between a potable water supply and a source of contamination. A backflow is a change of pressure in a water pipe that forces water to flow opposite its intended direction, allowing contaminants to enter the potable water system through unprotected cross connections. Cross connections occur around the home as well as in municipal water systems and can involve low-or high-hazard contaminants. What is a First Flush? Is there one perfect type of First Flush device? Where do I put a First Flush on my rainwater catchment system? 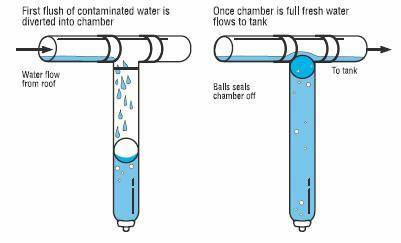 First Flush or Rain Diverters, as the name implies, flush off the first water of a storm before it enters the storage tank.